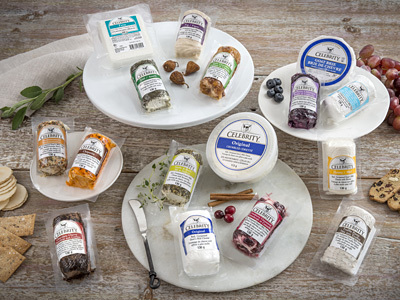 Made in Canada using the premier milk of soybean-fed goats, Celebrity has created a sensation with its innovative line of Goat Cheese flavors, including Cranberry & Cinnamon, Blueberry & Cinnamon, Fig, Honey, Dill, Garlic and Fine Herbs, Mediterranean and Original. Our cheese are made in Ontario, from 100% pure goat's milk from the region. Sea salt is added to the product, which is beneficial for the health conscious person or vegetarian, as it contains no iodine. For persons with lactose intolerance, goat cheese is a healthy alternative to cow's milk cheese products. Goats are fed roasted soybeans, which are higher in protein and energy, plus corn-fed from products produced on the farmstead. Goat milk is lower in fat and cholesterol, higher in calcium and Vitamins A & D. Goats convert all the carotene in their diet to vitamin A, leaving the milk and cream pure white. The yellow colour in other dairy products is due to the carotene in the milk. Our goat cheese is pasteurized. Celebrity International Goat Cheese Crumbled Cups comes in Original flavor.